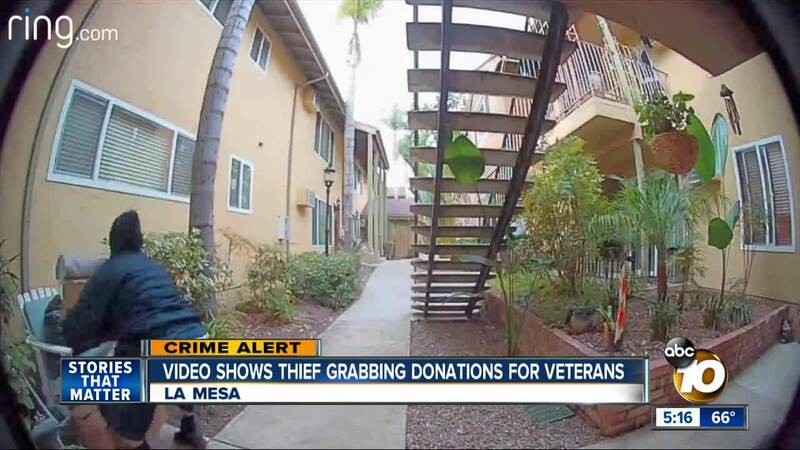 A thief in a hoodie made off with a haul in La Mesa and the contents of that haul are sparking outrage. 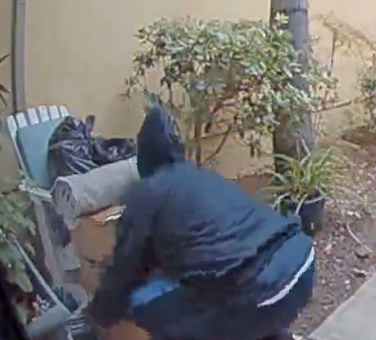 LA MESA, Calif. (KGTV) - A thief in a hoodie made off with a haul in La Mesa and the contents of that haul are sparking outrage. Outside her condo just off El Cajon Boulevard, Kathleen put out several bags and boxes right outside her front door Monday morning. "A lot of sweaters and warm winter clothes, a couple pair of shoes and a teddy bear," said Kathleen. Also included: Several throw rugs and some households items. Stuck on each box and bag was a sticky note with the name: Vietnam Veterans of America, the group picking up the donations. "They weren't scheduled to come until Tuesday," said Kathleen. So when Kathleen came home Monday afternoon and discovered the donations gone, she checked her Ring camera footage. The video begins with a person in a hoodie, bending down, lifting a box and throw rug, and then running off. Kathleen says the camera wasn't rolling when the other stuff vanished. "Really sad they take from Vietnam veterans," said Kathleen. Kathleen comes from a military family, including a brother who served in the Vietnam War. "It's heartbreaking. These are people who wrote a blank check to the government with their lives, for our freedom," Kathleen. Neighbors saw the same hooded figure dumpster diving around the same time as the theft. If you have any information, call La Mesa Police at 619-667-1400.